“It saddens me to announce that the four upcoming shows in Latin America this month supporting Halestorm will be my last with Adrenaline Mob. Unfortunately, I have scheduling conflicts that prevent me from being able to fully commit to the band’s future activities at the moment. As I cannot be in two places at the same time, I don’t want to hold them back and have to wait for my schedule to re-open up to resume activity. Adrenaline Mob was formed in early 2011 by singer Russell Allen (Symphony X), guitarist Mike Orlando and drummer Mike Portnoy (ex-Dream Theater). They released a covers EP entitled Covertá on March 12th, 2013. This guy just needs to be a solo artist because he’s too fickle to be a part of a band. It’s one thing to multitask, but he can’t even follow through and tour behind a project he just worked on. Some people seem to think it’s because of some insatiable creative appetite, but it seems to be more just a plain old case of ADD or lack of commitment and professionalism. He’s like a two year old that wants everything and gets distracted and bored with it a couple minutes later. It’s equally annoying the kind of hype and subsequent clout this guy has when he clearly doesn’t deserve it. I love TMS, but can we please have a season that isn’t ridden with this guy’s presence? I know he’s one of Eddie’s buddies, but he’s not the consummate professional and performer like a Carmine Appice or Tommy Aldridge, nor is he on the level of a Neal Peart like some seem to think either. At best he should be doing drum clinics where his cds should be sold to anyone willing to buy them, that’s if he could even follow through on his clinics. This guy is so flakey, he’d probably cancel on himself. He fucked up by quitting Dream Theater in the first place..realized too late what a mistake that was and then tried to get back in and the band moved on. He blew it there. He left DT over taking some time off..now he leaves this current band cause he has no time to do it..strange. Well, from the mind of a working musician, I can somewhat relate to Mike. Not in the sense of quitting a mega successful band like Dream Theater, but on this level, to some extent. He needs to work and be pro, since he’s doing The Winery Dogs with Ritchie and Billy now. 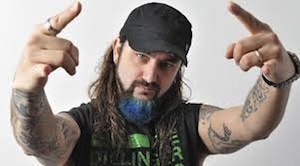 If Adrenaline Mob needs to keep doing their thing and he can’t fully commit to doing that with all the other stuff he has going on, bowing out and saying so is the professional thing to do. Plus, most artists and performers can’t make a decent living anymore being involved in just one project (unless you happen to be lucky enough to work for a band like Metallica, Iron Maiden, the Rolling Stones, etc.). So they have to make room for projects that will pay them and keep them working while others just came off tour, recording cycle, etc. Tim “Ripper” Owens is a good example of this. Between Beyond Fear, Yngwie, Dio Disciples, Charred Walls of the Damned, he’s always touring or doing something musically. I wouldn’t doubt that in addition to wanting to keep busy, it’s out of necessity as well. Sorry Seth, but that load of nonsense doesn’t cut it. If he needs to make money by being in multiple projects, then quitting one of said multiple projects is counter productive. If you want to use the business analogy, you don’t have to be a ‘working musician’ to understand what he’s doing wrong. He is being disrespectful to his fans and to the community that he wants to open their wallets and buy the product that he is shelling. In this case its Adrenaline Mob. Why should we get interested in something he is doing when he’s just going to leave it anyways? Its counterproductive to the extreme with him. I’m inclined to agree with Nic’s comments. Given his history over the past few years, I wouldn’t even touch this guy as it relates to working on a project with him. If you are going to be this flakey and jump from one project to the next, you can’t expect people to follow you and buy your product. What you can expect however, is comments like you are currently seeing on this article. I have to agree to a certain degree with being a fan and not wanting to invest, if he’s just going to jump ship. But from a working musician’s standpoint, it’s not a load of “nonsense”. It’s a cold hard fact. However, if you’re a full time musician, and in multiple projects, your co workers ought to be informed that you will need to make ample time for all of them to flourish. His reputation is what he’s really hurting, because if he keeps it up no one will want to work with him. So I don’t blame fans for not wanting to support him, since his behavior is kind of flaky. I’d imagine he’s just trying to do as much as he can to keep his mind off the fact that he’s no longer in Dream Theater. I don’t have much else to add here, other than if you’re not or haven’t been a real working musician, you really have no idea of what it’s like trying to earn a living and sustain a halfway okay lifestyle. But if you’re in a successful project and have loyal fans, it doesn’t give you the right to just bail on them and then expect them to follow the new thing you’re doing, or several in his case. I hear ya Seth. But like I say – if you run a business like I do its no different. You’re manufacturing and selling a product. If you don’t stand behind the product or have a history of not standing behind the product, its awfully hard to convince customers or shareholders (or fans) to give you any of the money you need to survive. I completely agree with on your DT comment. Clearly he f’d up bad and knows it. Now he’s a wandering talent who’s turning into a bit of a joke. Spinal Tap is looking for ANOTHER drummer. Just sayin! I like MP’s drumming on DT’s cover of Zebra’s Take Your Fingers From My Hair! !